I love looking at homes whether it is through blogs, magazines or even a home tour in person. 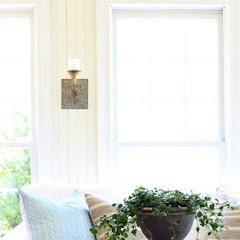 My home doesn't stay the same for very long since I am always changing things up a bit so I thought I should update this home tour that stays on my sidebar. Some photos are new and a couple I left that show seasonal changes. Not all these rooms will stay like this for long. I told you I change things a lot. Crepe myrtles in bloom in the summer. Old shot to show garage in the back. To the left is the sitting room. I think I will be painting this room a new color soon. Across from the sitting room is the dining room with a mix of French Country furniture and the hutch I painted. The great room/family room is on the back of the house and is the largest room with a 20 foot ceiling and a wall of windows. We only have woods behind us so it is very private. The breakfast room is to the right of the great room. Mr. Savvy added the beadboard wallpaper and trim and I painted it. I love this change. Now let's visit the heart of our home. This is the view when we come in from our garage. We had our kitchen updated a few years ago. When we built our house I had a totally white kitchen except the walls were wallpapered. We had white cabinets, white counters and white linoleum flooring. Yes, it was bright and white because our first house had a dark galley style kitchen so I went complete opposite on this one. This island was black and I painted it recently in this green gray and love the change. You can see the tutorial of how I painted them here. You walk through the breakfast room to the sun room that we added on ourselves several years ago. The deck did run across this far, but we couldn't see our pond without going out on the deck and I wanted to enjoy from inside. The walls and ceiling are real tongue and groove bead board that Mr. Savvy installed. Let's venture over to the other side of the first floor to the master bedroom that was just updated with fresh paint, new carpet and drapes. Master Bath walls were painted last year and then I painted the cabinets. Let's go upstairs to see the guest rooms. Farmhouse style guest room. This room was another project I did this year. It had a nautical vibe for a few years, but I was ready for brighter fresher room and added touches of farm house decor that I love. Well, I think that about covers everything except the bonus room/hoarding room which is off limits. It would make your eyes hurt so I won't do that to you. If you want to see more just type in whatever room you want to look at in the search box on the sidebar and hopefully it will give you a list to choose from. I don't think you ever shown us your deck! I wondered if you had a deck/patio, porch - what out back. Gorgeous home tour, Kim! I love all of the custom features you all added over the years ... never realized that you all were on 3 acres! Tina, the deck is nothing to look at. I did share it a couple years ago after decorating it somewhat for a summer link blog party. Our back yard is in horrible condition right now since the grass died and was overtaken by weeds. It needs lots of work. What a gorgeous home. Love those stools in your kitchen...they work perfectly for the style of your place. 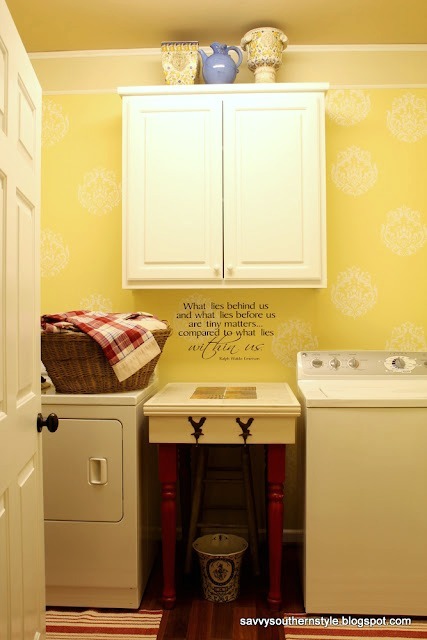 Your home is always lovely and I remember following along with some of these changes. WOW - I found so many subtle ideas that truly set off your rooms. Your home is lovely and you are an industrious, creative and talented team. Thanks for the tour! Hi Kim, I loved seeing your home; what a wonderful accomplishment you and your hubby made by building your home. I just can't get over how incredible it is. You have such a incredible gift for decorating-it looks like it should be on the pages & cover of a magazine. Hopefully, when hubby finds his dream house(within the next year) we will have nicer finishes. Love your place!!! Beautiful! Thanks for sharing. I could definitely come spend some time in your home! Kim, your home is beautiful! My first time looking at the outside, it's truly as gorgeous as the inside! I love your style. It's beautiful Kim. I love that you keep updating everything, so it never feels old. I'm fascinated that you added the stone to the front of your house, and changed out the garage doors. I'm sure it made a huge difference in the appearance. I never think to do things to the outside of the house. Our bedroom layout is so similar to yours. It gives me a lot of good ideas, if I could ever find the time! 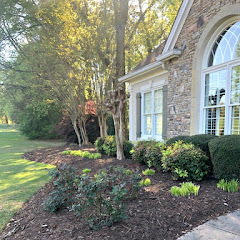 Thanks for sharing your updated home with us. It was fun getting a new tour of your beautiful home Kim. I love seeing all of the updating. Kim, you have one of the most gorgeous homes, inside and out, in the blogosphere! Thanks for the tour, we will never tire of looking into your home for inspiration!!! Your home is lovely! So comfy and cozy and elegant! Luv all the little bits put all together Kim. Beautiful!!!! I am always so inspired by your home. Oh wow, Kim! What a great tour! This could have been about 20 posts... all in one! Your home could and should be in a magazine!!!! Hope some day to see it in person! Hi Kimmie! Oh, I've so enjoyed the tour of your most gorgeous house. It's so beautiful and I can't believe it but I know you'll be changing something up soon. Kim - Your home is gorgeous - inside and out! I'm sure the fact that you all built it makes it even more special to you and your family. Kim, your home is so beautiful and obviously loved. I love a good home story and how it evolves. I want my home to grow with me like yours has. My new home, that is. You don't have any unfinished rooms. Lucky you! What a fun tour! It's just lovely, Kim -- I love that you're fearless about changing your looks! Kim it is always a treat to tour your beautiful home! 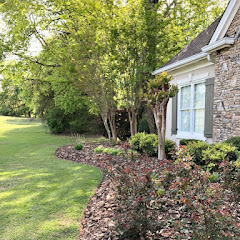 Your landscaping outside is just as beautiful!Yes I know all about changing things around ;-) . Love every inch of your home!!! !...every time I think that you have accomplished the "perfect beautiful room"...you make a change and make it even more beautiful!...But I do have one question....where's Bailey, the furniture model???!!! Your entire house is absolutely stunning, Kim. Not many can pull off the decorating feats that you have by constantly updating, changing, and doing most of the work yourself. Kudos my friend. I agree with Yvonne...you should be featured in a magazine! Lookin' good, Kim! 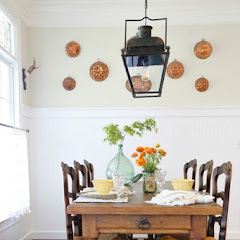 And loving the color and farmhouse look. Your home is so lovely and filled with personality, Kim! Thanks for sharing it! Kim, I just love your home....it is absolutely gorgeous.. and decorating is beautiful. God bless! I love every single detail, Kim! You have no idea how in love with that yellow table and chairs I am. I think you should bring them to me...immediately! Just beautiful!!! Kim..your home is beautiful...you are such a talented decorator...but I have to say I really miss the red check panels in your eating area...I know you moved them to one of the bedrooms but I loved them near the table...love the buffalo check dust ruffle too!! 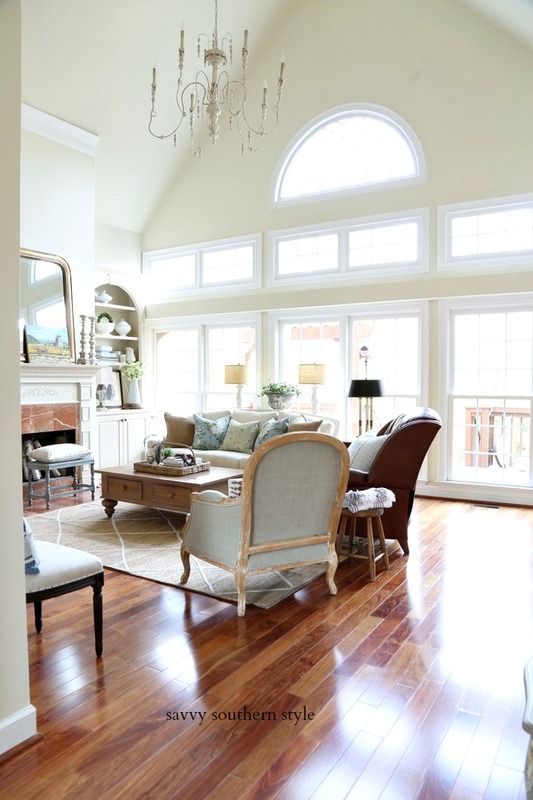 Love your home Kim~and of course, my favorite is the sunroom!! Such a great house tour !! Going to have to do one of these sometime too!! Your home is beautiful inside and outside. What a beautiful tour you have given us. My favorite room is your sun room. I just would be out there all day long. It is just so cozy and pretty. Beautiful! I have to ask...where did you get all of your antlers? LOVE the tour, Kim! 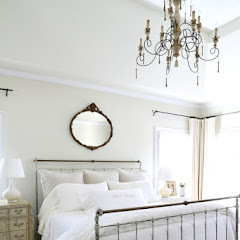 Your master bedroom is perfection! Kim, Thank you for graciously opening your home for an updated tour. It is beautifully built and decorated. You and Mr. Savvy are quite a talented team. While I love painted furniture, especially your dining room china cabinet, I really LOVE the antique French vaisselier with its burl wood. And of course, I thoroughly enjoy all your extra bedroom makeovers using PB outlet bedding. I discovered there is a PB outlet in San Marcos, TX and its on my list to visit this summer. Just a beautiful home. I really love the exterior too! Each room is gorgeous...and has such a great feel. You've put a lot of hard work and effort into each detail and it shows! Kim....beautiful home....you and your husband have done a fabulous job! I love all of your special touches throughout! Your home is just gorgeous - thanks for the tour! Your home is beautiful and I love your style. Hearing about the history of your home was fun. Very lovely exterior! Such a labor of love that you and Mr. Savvy have accomplished! Sometimes I ask myself, "Now why did she change that? ", but you always come up with something equally as pretty! I always love walking through your house. You mentioned building it yourself when you both had full time jobs. Do you have a full time job right now? I always wonder how you have the time for all your paint changes and room redos. Beautiful home, Kim-know the joy your receive from decorating it! Loved seeing an updated tour of your lovely home all in one place, Kim! Thanks for sharing your lovely home with us blog readers. You're an inspiration!! Your house is beautiful ---where do I start? okay so what I love best about your house is all of the classic elements. Beautiful plates, buffalo check and plaid. No matter what they never go out style. enjoy your home! Your home is beautiful. In one of the first pictures at the bottom of the stairs there is a chest with toile scenes on each side on the cabinetry doors, is that painted or is that a fabric. I love toile and this chest is beautiful. Hi Kim, Your home is warm and welcoming. You've done a wonderful job and I'm sure your house guests feel at ease and always welcome. I enjoyed visiting your home. You have beautiful taste! Thank you for sparking some inspiration in me to make some changes in my home. Sometimes we need to see an example to help us think in a different direction. Thank you!